I just got this great bark collar from Cujo Control. This is a great device that can help to reduce the negative behavior of barking. It’s really well made. Comes with everything you need to install and use. Comes with a collar (or you can use it on your own collar), comes with bark controller and battery is included, and leads. The way it works, when it is on (you can adjust the setting to your desired level), if the dog begins to bark it will administer a small static shock and a beep to distract the dog, get it’s attention, and stop it from barking. We got this to use for our new dogs. We are trying to train them not to bark when we have company over. We only use it when needed and training. It works well. They notice the shock & beep and it stops the behavior quickly. Fits them well and works great. 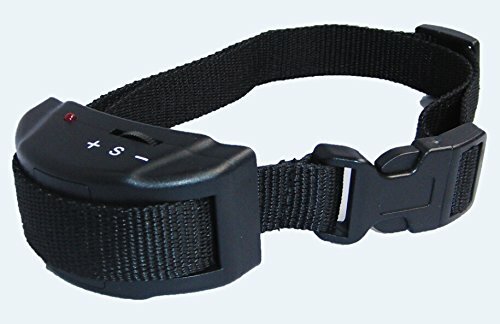 HANDS OFF DOG BARK COLLAR KEEPS NEIGHBORS HAPPY WHILE YOU’RE AWAY. Prevents barking while your dog is unattended, no remote needed. Beep and static correction are used when the lightweight receiver detects vibration or sounds from your dog’s throat. Harmless static shock is not harmful to any dogs. PREVENTS AGGRESSION WITH OTHER ANIMALS. Small breeds and large breeds – this no bark collar is perfect for small dogs and large dogs, even toy dogs. 7 adjustable sensitivity control settings allow you to adjust to your dog’s bark intensity. Adjustable nylon collar and adjustable strap included. FRIENDS WILL BE COMFORTABLE COMING OVER now that your dog has a no bark control collar. No harm shock control produces 2 warning beeps. On 3rd bark, the anti-bark collar will emit an electric shock. After 7 continous barks, the unique bark terminator will turn off device for 1 minute to prevent harm. WHEN YOU ORDER YOUR CUJO CONTROL ELECTRONIC NO BARK COLLAR TODAY, you’re protected by a lifetime, no questions asked money back guarantee and world class customer service!